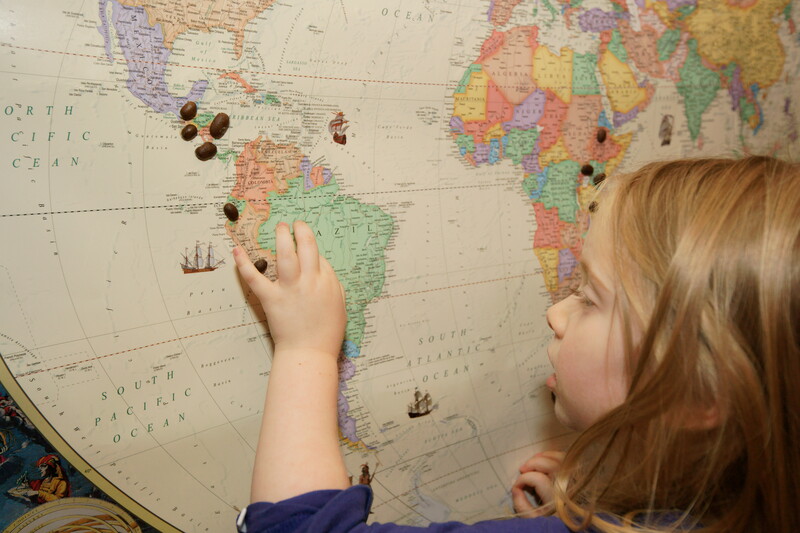 Every time we buy a new bag of coffee beans I take Ella over to the coffee map that hangs on the dining room wall and let her place a bean, marking the country where the coffee was grown. 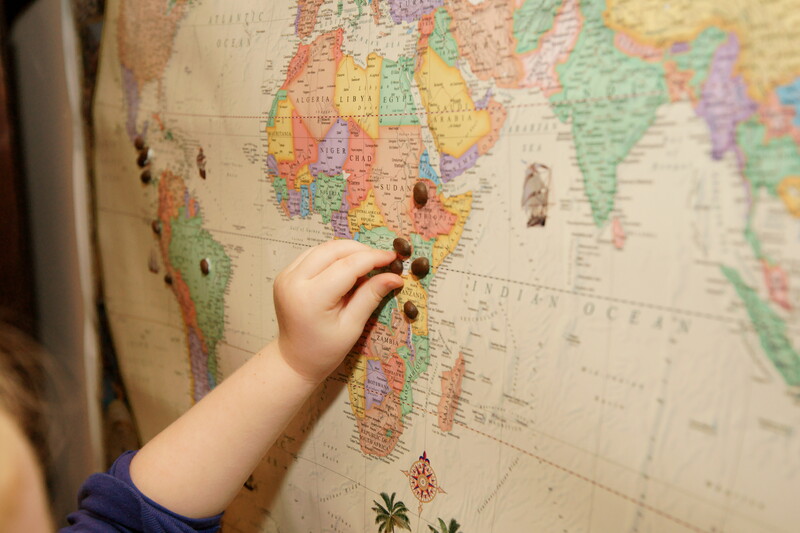 If there’s already one there, she will sometimes insist on replacing it with a new one, or we just savor the aroma of the freshly roasted beans we’re holding and talk about the countries and continents that are marked on our map. 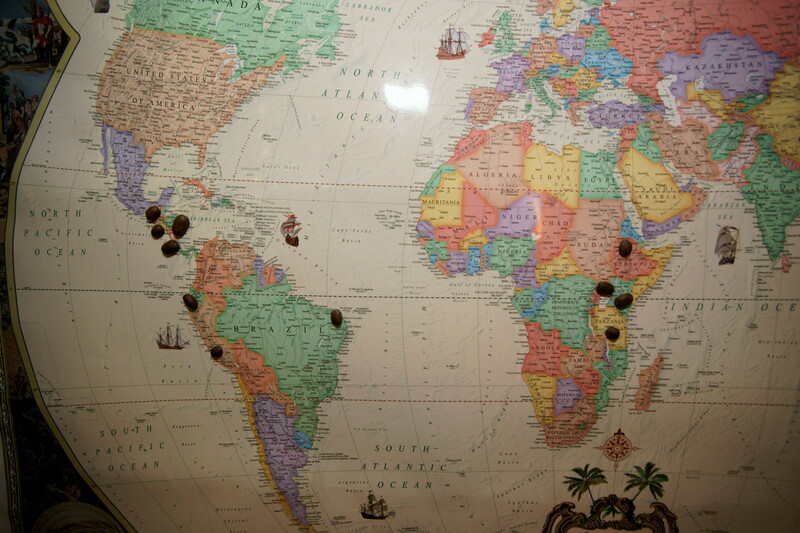 It’s so much fun decorating maps with a specific focus, and I’ll be decorating another one with seeds or whole spices in the near future. 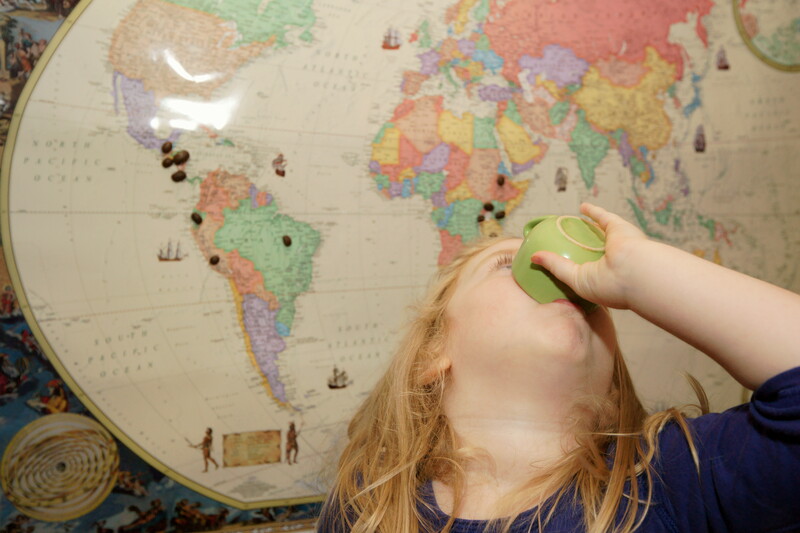 By introducing regions of the world with things Ella can hold, smell and taste, I’m hoping to capitalize on her senses to reinforce the geography lesson. You might find this strange, but Ella has always been a fan of coffee. 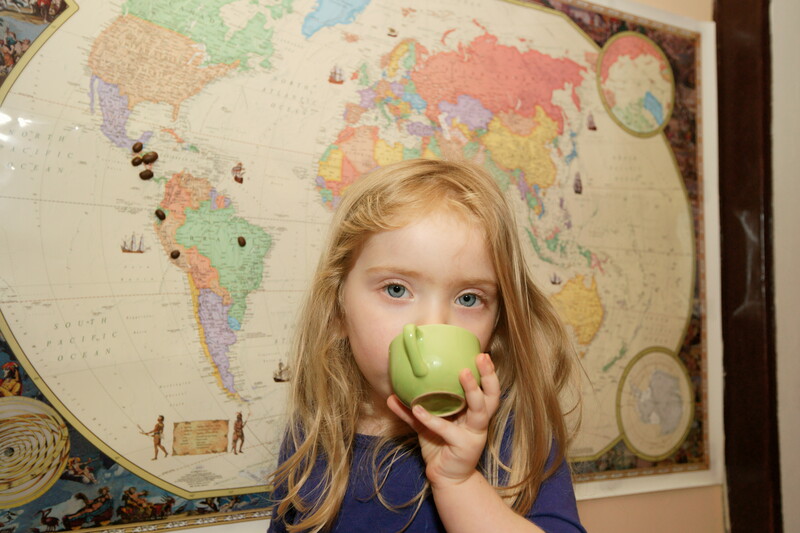 It may be because we took her traveling around the country when she was 8 months old and she was exposed to some of the finest coffees roasted around the U.S. (at this point she was only smelling them of course). As we drove through a hot summer and into the fall, and our car’s air conditioner recycled the blissful coffee aroma for seven months, we had only two major goals: to find a new city we’d be happy moving to, and to try as many highly rated U.S. coffee roasters as possible. Because we were living on the road, we’d have the roasters grind our coffee selection for our french press. With every sunrise, Ella and I would stretch out from our cramped sleeping positions in the car (sometimes we’d be lucky enough to have found a place to set up a tent, but frequently it was just too hot to sleep without a/c) to set up our camp stove, boil some spring water and wait to taste our latest find. Road tripping with a baby can be really magical, and I savor the memories of those quiet moments in the dawn’s light when baby Ella and I both marveled and cooed at the world’s beauty while waiting to press the coffee. By the time Ella was 16 months old she was grabbing coffee bags off store selves to give them a good squeeze under her little nose without any encouragement from us. 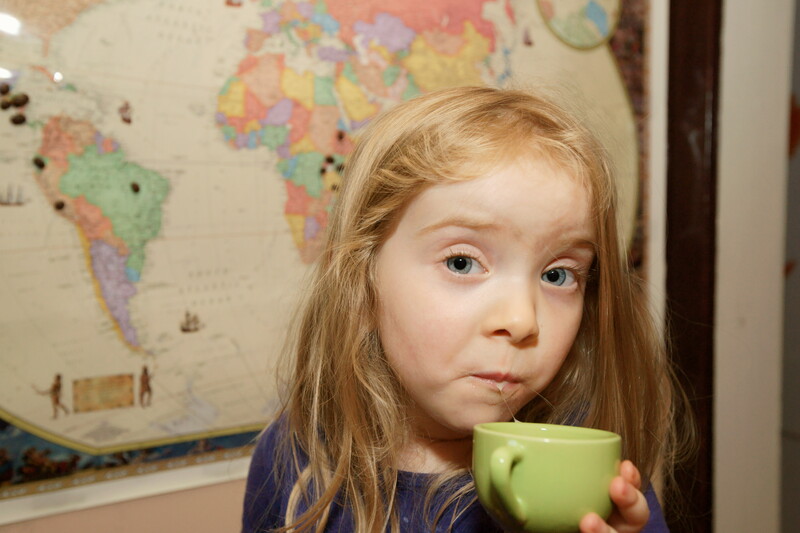 By 2 years old she was sneaking the last sips left behind in abandoned coffee mugs, and now at 3 she frequently asks for her own cup. Now, even though she likes sipping black coffee, her own cup consists of 80% – 90% milk and totals no more than 4 oz because I’m not about to willingly caffeinate my toddler. I don’t, however, see anything wrong with raising her to have an appreciation of fine coffees, or dark chocolate for that matter. Purely by coincidence, we moved to Chicago, and plan to move to Portland when our Chicago adventures are through.